CROWN HEIGHTS — For nearly six months, Crown Heights' state Senate seat has been empty — one of four state-level elected positions in Brooklyn that remain unfilled since officials moved into new roles on Jan 1. Despite calls for a special election, Gov. Andrew Cuomo has opted to leave the seats empty through the regularly scheduled Sept. 9 primary, the same date for all of New York State’s local and state elections — a decision now-Brooklyn Borough President Eric Adams, who formerly represented Crown Heights' District 20, has openly criticized. Three locals have already stepped forward as candidates to represent District 20's gerrymandered borders, a puzzle piece that also includes parts of Sunset Park, Brownsville, Gowanus, Park Slope and Prospect Heights. The bulk of the district comprises Prospect Lefferts Gardens and Crown Heights, where all three candidates live. 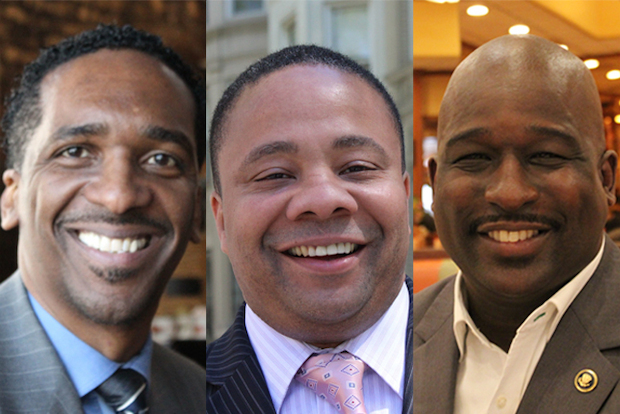 DNAinfo New York spoke with each of the three hopefuls — Rubain Dorancy, Jesse Hamilton and Demetrius Lawrence — about what they want to bring to the district, with strong commitments to education, community involvement and civic duty common among them. Born in East Flatbush and raised in Crown Heights, attorney Rubain Dorancy, 43, has seen the ups and downs of the district he hopes to represent. It’s "an amazing place to live,” but high unemployment, “the specter of overdevelopment” and under-funded public schools threaten its residents, he said. As a Department of Education administrator, school board member and former teacher, education is Dorancy’s area of expertise. He said he believes solving problems in this domain will help cure other ills. “Sometimes to solve a problem, you have to make it bigger,” he said. “You have to think about these policies in a broader, comprehensive context.” To him, that means tackling problems at schools to deal with poverty and unemployment. Solutions would include ensuring “fiscal equity” for public schools, re-establishing school boards and making sure charter schools accept students with the same demographics and needs of the communities where they’re located. “It’s not to punish them,” Dorancy said. “It’s actually to allow the charter schools to fully live up to their original intent,” which was to teach traditional public schools “how to get it right,” he said. Dorancy said he would support the New York State DREAM Act and legislation that would increase the minimum wage, hold developers accountable for creating mixed income housing and work to ensure that more minority- and women-owned businesses are hired to fill contracts for the state. But above all, he said he wants to do what his Haitian-born parents taught him and his five siblings: to work hard. “You have parents that bought into this idea that if you work hard, you go to school and we support you, you can do stuff," he said with a laugh. And he's not afraid of being held accountable for getting work done. Jesse Hamilton will tell you he’s very proud of his block. A lawyer for the Department of Finance and current district leader of the 43rd Assembly district, Hamilton began his civic life in the neighborhood at his block association on Lincoln Place in Crown Heights, after moving there in 1993. He likes mentioning issues that he and his neighbors have worked on over the years — traffic patterns, a landmark designation and the renaming of a street for Benny Lyde, a young man from the area shot and killed in 2005. Hamilton has many endorsements for the state Senate seat already, including from Adams, and said he has “five or six thousand” signatures from supporters. But he said his work is what matters. “I just figure, I’ve done good work in the community and it speaks for itself,” he said. Topping his list of priorities in the district are improving housing, employment opportunities and education. Elected president of his local community school board in 1996, Hamilton saw the effect good schooling had on the area. Now, he said, the rise of charter schools is troubling. “It kind of takes me back to Brown vs. Board of Education, you know — separate but equal. But it’s not equal,” he said. He also worries about aggressive tactics in housing and development — whether it's the use of eminent domain at the Barclays Center development (“a public taking for a private use,” he called it) or the Department of Housing Preservation and Development "downsizing" longtime tenants of Tivoli Towers, from where he gets many constituent complaints. With vacant seats across central Brooklyn, Hamilton said he has been fielding many questions and requests from all over the borough, not just from within the district. “You see a lot of people coming to our office now. You have four Assembly offices that are closed near us,” he said, adding that the office stayed open despite the campaign and the ambiguity about the special election. After a year of considering running, Demetrius Lawrence, 41, took time off and a pay cut from his job as an IT project manager to officially kick off his campaign in early February. Although campaigning can be “grueling,” the longtime Crown Heights resident said it’s a “beautiful” process. Goals for Lawrence include increasing funding for public schools, changing the dialogue around gentrification (“We have to embrace it and not run away from it") and fighting co-locations of charter schools, something he dealt with firsthand at his daughter’s school, where a Success Academy charter school will move in this fall. If elected, Lawrence would be happy to vote for the DREAM Act and to create a state living wage. But whatever the outcome, he knows he’ll always be in the neighborhood, helping however he can.